"We continue to ask for, and expect a full investigation by the Florida Department of Law Enforcement into the reason why Mr. Testa is now dead. The family is asking for prayers and extends their heartfelt thanks to those who have reached out during a time that should have been filled with holiday joy," the statement said in part. The Jacksonville Sheriff's Office said on Thursday they will be handling the investigation. Testa was booked into jail Dec. 21 without incident on criminal mischief and trespassing charges, which court records show were later dropped. 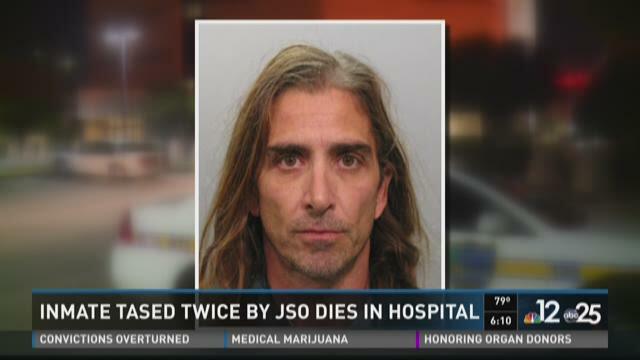 Following his arrest, Testa started acting rowdy, according to JSO. Authorities had to use a taser on Testa when he would not stop resisting them and had him checked out by medical staff earlier on Monday before his first appearance for his criminal charges, police said. After his first appearance, while Testa was being led out of the courtroom back toward the jail, he heard that the judge ordered him to be committed under the Baker Act. Police said he did not like that and charged back into the jail, forcing officers to restrain him again. Testa was led back to the sixth floor of the jail where his cell was when he began to fight with the officers again, police said. And again, officers were forced to tase Testa and decided to put him in a chair designed to restrain inmates that are viewed as a danger to themselves and others, according to JSO. It was at this time that police noticed Testa was unresponsive and called for him to be taken to the hospital, authorities said. First Coast News has asked for a copy of surveillance video of the incidents. A JSO spokesperson declined that request, saying jail video is exempt from Florida's public records law. Police said that Testa's criminal arrest early Monday morning was the first in Duval County they have on record, but they were called out to his home on a mental health call. He reportedly threatened to kill his neighbors and burn his house down. Authorities also found him with a machete strapped to his leg.